The third week in April is National Pet ID Week. So what is that? A pet ID, or identification, is a way to help lost pets get home. The most common way that was used in the 20th century was the collar tag. 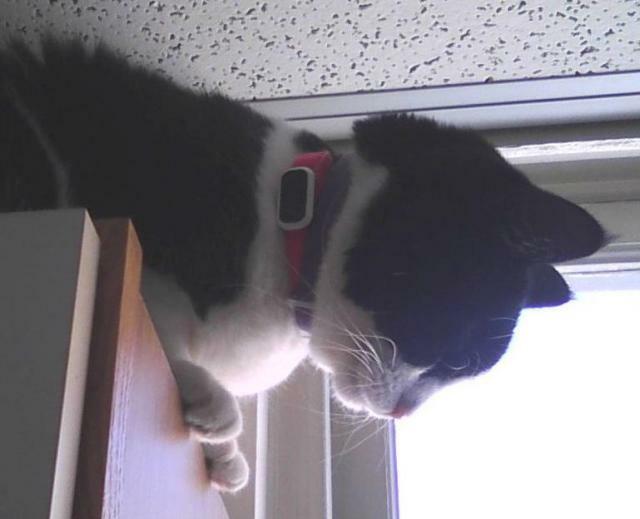 I used to have a collar tag that hung down, but I bit at it too much, and my human had to take it off. Now, they have microchips, which are little computer chips that are injected in between my shoulders with an ID number. When a vet has a scanner, they can find my number, and call it in to the database so they can contact my human, if he has updated his contact information there. They also check to see if they can read the chip when I go for my annnual vet visit. It is registered with the company that provided my chip, but there are other companies that can register your number. He has added my information at one of those other companies. Some people might not want to give inside cats a chip or a tag. Others think collars are too dangerous for outside cats. I recently wrote my thoughts about colllars on this site. He had been thinking about whether or not to get me a microchip. Then the tornado hit Moore (Oklahoma), and lots of inside-only kitties suddenly became outside kitties because their inside wasn't inside any more . He then decided that having a chip that stays with me would be a good idea. I haven't been an outside kitty since I moved to this state, and he doesn't want me to try to find my way back to the farm 300 miles away and on the other side of the big river. At the vet clinic we go to, they had a discount card on the table from a company that makes tags that wrap around the collar rather than hang down so we can bite them. He ordered one for me. He has my microchip number on there, along with my name and his phone number. He also has the chip company's toll free number. (His name would not fit on the small tag with all that other info.) You can see the tag around my collar in that picture.